If only her nephew were able to read Superbia's mind. Dear boy, it was not so many years past that I too was struck by cupid's arrow. An ugly sow like me was bagged, then betrothed, to a king . . . could any couple have been more mismatched? 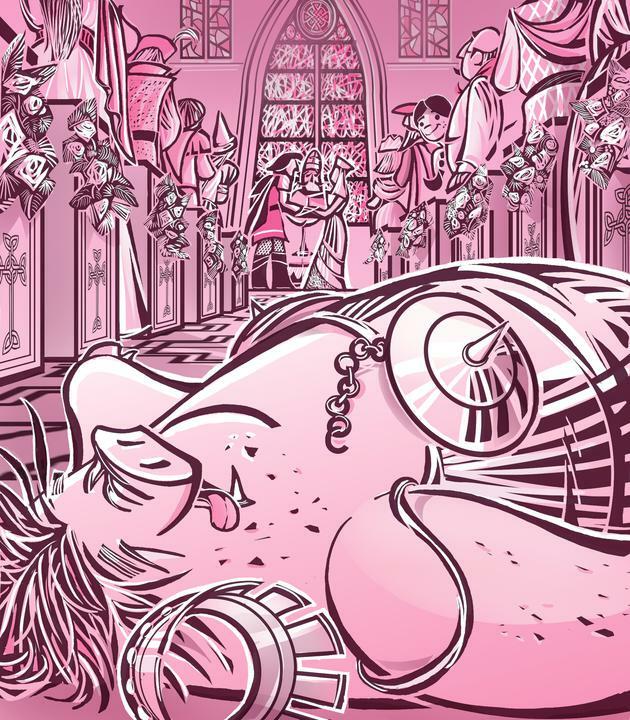 Could any bride have less to offer—Suddenly the Queen felt another of her swoon's coming on. There would be no DOWRY! She gasped for air . . . And no new landholdings! . . . “Oh-h-h!” She cried for Dulcy, but no one heard. All attention was riveted on the couple at the altar. The chapel quaked slightly as Superbia toppled from her seat onto the floor. And there she lay, momentarily at peace, and looking more content than she had all day. What, you may ask, became of that other couple that was 'almost' married? Well, a girl can wish can't she? On their way home that evening after the ceremony, Milly squeezed Tuft's hand as they walked along the road to their fold. Without their oxcart it might have been a long uncomfortable hike, especially for Tufts. I say 'might have', because their cart was parked a little farther up the road. Waiting to give them a lift was another pair of lovebirds—a very familiar pair—Lady Veronica and the steward's son, Aaron.